In spite of the bull moose on the cover artwork whose blood-red background and the dissection in four parts of the outline of the hugest member of deer family, it's neither a leaflet for butchers nor a christmassy idea of gift, even if the debut release by this fourtet is much more interesting than the invasion of records from mainstream musicians that majors normally led in this period by means of marketing necromancers! The initiative got drawn up by talented Norwegian vocal artist Andreas Backer who grouped Stale Liavik Solberg, a brilliant drummer who was his mate at Stavanger music academy, Swedish guitarist David Stackenas - we already met his name and his skills on some collaborative releases with Ernesto and Guilherme Rodrigues - Canadian expat double bass player Joe Williamson together and recorded this amazing live session in Sweden, where they insert contemporary classical music, free-jazz and European improv hooks as well as a remarkable numer of sonic ideas in a blender that flushes amazing dynamics out. The opening title-track "Eye Of The Moose" manages to keep a certain poise as if they were trying to find a first cautious attunement, but things radically changes on the following tracks: "Antler Of The Moose" charges eardrums by means of twisted scratches, more dissonant interactions and swirling cracks and Backer's vocals brilliantly follows this gradual nervous breakdown and could sometimes surmise a preacher fighting against rising voltage of an electric chair; "Claw Of The Moose" digs into eardrums by the slow asphyxation that got rendered by gargling vocals, eruptive torsions and crumpled guitar strokes and the rattling final track "Tail Of The Moose", where last and almost breathless vocal runs by Andreas meet the last amazing instrumental rush of popping mute hats, thundering double-bass and tangled mess of guitar tones. The first ring of Silo, the brand new label by Raz Mesinai aka Badawi and Jonathan Uliel Saldanha aka HHY, one of the founding member of Soopa collective and one leg of Fujako, the abstract-hop project I spoke about on the occasion of "Soul buzz EP" a couple of months ago that he leads with Nyko Esterle, comes from the collaboration of Saldanha and The Macumbas, a Porto-based underground collective whose number of people varies even if some musicians such as self-taught drummer and percussionist Joao Pais Filipe and trumpet player and vocalist Alvaro Almeida are almost permanent. The mesmerizing intro of the opening track "Isaac, The Throat" as well as the distant horns and the dub-like obsessive delays whose sound seems to be enveloped by clouds of desert sand could let you imagine that the following sonorities comes from a broadcasted nightmare where they wisely spinned dub, tribal drumming - closer to bedouin trance dances -, screaming jazz/funk, electronic fibres and occasional diffractive sonic elements that could sound like a possible crossbreed between Muslimgauze, The Master Musicians Of Joujouka and Le Sony'r Ra's mystical tangents as well as amazing hooks to 7'ies blaxploitation sonorities on tracks like "Barbaron" and "Lewopa De Kristal". A very interesting debut, even if I can surmise that one of their live exhibitions - I think some people who heard them at Sonar and Primavera Sound can confirm my assumption - could be much more engaging. Lawrence English, who recently told some adventurous details about this release, and Werner Dafeldecker, who came back after a period of fallowing, joined their interest in the combination of electroacoustic and acousmatic techniques in order to lead listeners to explore some sonic crannies in Antarctic Peninsula, a place which most of people won't visit every day, by means of a paraphernalia of hydrophones, aerial and contact microphones. The recordings they collected while staying in those regions got later reassembled in Brisbane and turned into a soundscape, where the almost total absence of human elements matches the somehow dashing desolation of the most inhospitable place for human settlements on our planet, which nevertheless keeps on inspire many musicians and sound artists. Since the opening track "Fathom Flutter", where you could imagine that these artists managed to ignite ice blocks while listening the frozen crackling over the first five minutes of this polar scanning, the listening experience on "Shadow Of The Monolith" is so weirding that even the occasional clues of human activity on tracks like "Marambio" that they supposedly grabbed inside the Argentinian Antarctic base, or "Fall", where they seems to have taken the noises from attempts of anchorage of underwater probes, as well as the coring out of glacial gusts of wind in "Mapping Peaks" and frozen waters of "Rio Gallegos" seem to belong to other worlds and such a sense of immersive estrangement got reflected in the only two "musical" tracks, "Intake" and "Outtake", where Lawrence and Werner hybernated abstract chimes that brush against deafening silence. Four years after "Hexagonal", Celluloide are back with a new fantastic album titled "Art Plastique". 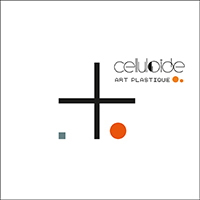 Always formed by Darkleti, Member U-0176 and Patryck Holdwem, Celluloide succeeded into making an album that works under different sides: it has really catchy melodies, sharp warm sounds, upbeat rhythms, rich sounds palette and more. The eight tracks of the album are able to catch immediately the attention of the listener and to involve him into a deeper listening which will bring him from the start to the end in a flash. Yesterday I wanted to start this review and I found myself listening to it three times in a row, without writing a single word. Instead, I was trying to understand the lyrics (that this time are only in French language), I was making attention to the bleeping sounds that were popping out from my studio monitors just to found myself tapping my foot on the e.b.m. hard rhythms of "Gris", wandering with my mind following the dreaming atmospheres of "La Guerre Des Cent Ans" or the mid tempo sensual of the single "L'Amour Est Claire". The album starts with a blast thanks to the complex bleeping rhythms of "Le Baiser Geometrique", song that mix e.b.m. intuitions, romantic atmospheres and synthpop catchiness. This for sure is a winner, but the band did an excellent work with all the tracks of the album and the warm detached vocal style of Darkleti find its counterpart into the complex instrumental side played by Member U-0176 and Patryck Holdwem. If you never tried them, I think that this is definitely the time to do so!